A collection of student documentaries and films on Korea will be screened on Tuesday, October 16th, at 8:00 pm in the Park Auditorium. Students shot the documentaries; VISA: Travels of Labor, People Make Mistakes, and Free Trade in Seoul, South Korea, as part of a partnership between Ithaca College and Hanyang University, which is located in Seoul. 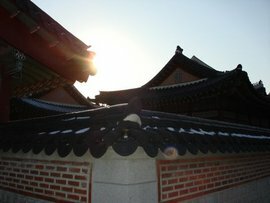 Students filmed the documentaries during a summer 2007 course, Cross-cultural Documentary Research and Production, which included both Ithaca College and Hanyang University students. Two of the other films, Jack O Lantern, and Honoring Home, were independent study projects by Ithaca students. The third film, Red, Yellow & Blue was created as part of IC professor Changhee Chun’s practicum class in spring 2007. While all of the films take place in South Korea, the subject matter varies from the struggles of migrant workers to issues surrounding the United States's free trade agreement with South Korea.